Jamaica is one of the Caribbean's most beautiful islands - its lush tropical vegetation spreads from shore to mountains. Its music is appreciated around the world. And its many beachfront resorts attract over a million travelers a year. Each has a different personality. It's number one in popularity. In the 1960s to 70s, hippies discovered untouristed Negril. In the 1980s, tourists began to flock in. Today, over a million vacation here. They tend to be mainstream vacationers. 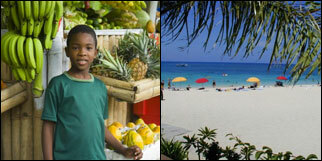 They are Negril's long white-sand beach, its affordable beachfront resorts, and its relaxed lifestyle. Negril is well-positioned for sunsets because it faces west over the Caribbean Sea. The sunsets are magnificent. Montego Bay is its most famous North Shore vacation area. Ocho Rios is also well known. The two Jamaica photos in my montage are copyrighted by the Jamaica Tourist Board. Both are used with permission.